Was there ever really any doubt? You don't want to say he was robbed last year since Oklahoma's Sam Bradford had an earth-shaking season as well. 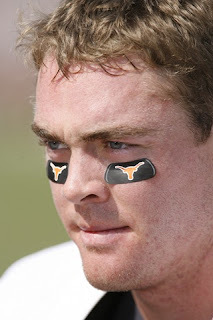 But D. "Colt" McCoy certainly got the short end of the stick. Now after some merely adequate performances in the first half of the '09 season, he is definitely revving it up around hardware time. The 304 pass yards, 175 rush yards and 5 total TD against A&M was Vince-esque...only better. Now he's just one win and an Ndamukong Suh from a a date with an engraver. This season has had some intriguing darkhorses, but they're fighting for NYC plane tickets now. Alabama's Mark Ingram was pacing the field, but looks like he needs some new tires on the last lap. Clemson's C.J. Spiller was spectacular enough, but he'd need a Reggie Bush type of win-loss record to go with his Reggie Bush type of season. Stanford's Toby Gerhart is a legit contender with 26 TD runs, but his games are on too late serving too regional an audience to impress enough voters nationwide. But McCoy is in position to complete the trifecta: Tebow, Bradford, McCoy. They each get one. Everyone's happy, socialism at its highest level (as is the BCS itself but that's another post). I do have a friend who is a resident of Texas' capital city and calls it "The People's Republic of Austin." How about a little love for the Longhorns' other #12? Texas CB Earl Thomas and his 8 INTs for the Thorpe Award! He's just a sophomore. Has one school ever has a Heisman and Thorpe award winner in the same season with the same number?? ?